I sent you a letter yesterday telling you that you were overdrawn .53₵ and that I added $25.00. I will get your statement from the bank today. You haven’t added or subtracted somewhere along the way – you have fail to subtract I would say. It looks like Sperry is climbing. So I won’t indent incorrectly, I will use the same method as in writing to John. I am enclosing your housing contract which Dad has signed. Thanks for the cartoon. I haven’t had time to decide about when I will come down – Thurs. or Fri. a.m. Will let you know in time to get me a room if I come Thurs. The weather has been real summery. I think we had a record high for May one day last week. It is making everything grow like mad. So far Dad has been able to get the mowing taken care of by himself. I am at the office but I am ready to go get papers and go to the bank. See you either the 25th or 26th. 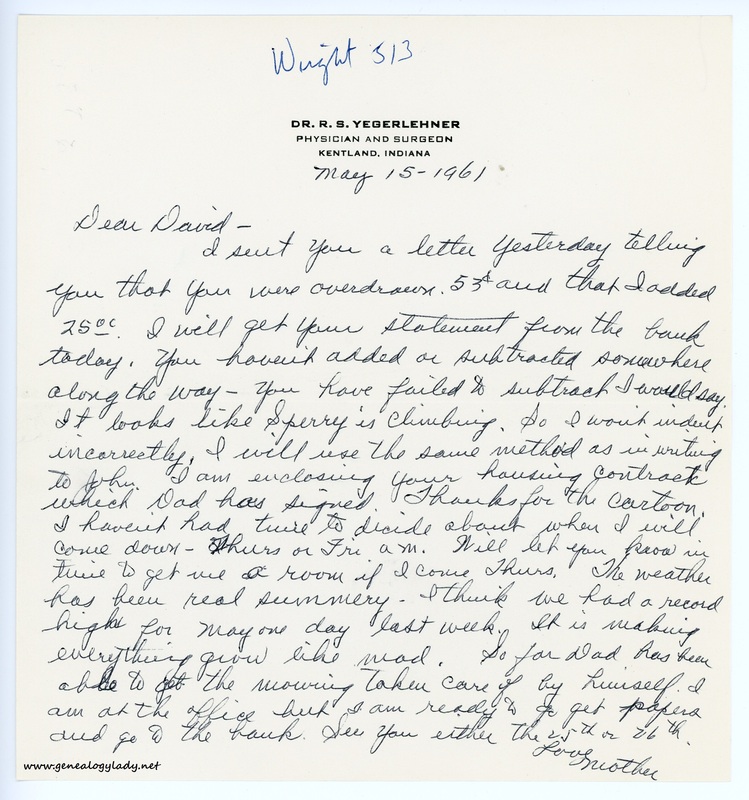 This entry was posted in Genealogy, Yegerlehner and tagged 1960s, David A. Yegerlehner, genealogy, Gladys R. (Foster) Yegerlehner, Indiana, Indiana University at Bloomington, Kentland, Roscoe S. Yegerlehner, Wright Quadrangle on September 22, 2016 by Deborah Sweeney.